As vehicle and component manufacturers the world over grapple with challenges in an era of disruption and the rise of megatrends like autonomous and shared mobility, connected vehicles and the digital revolution, they are also having to come to terms with slowing demand, particularly in developed economies like Europe. As global automotive production evolves, its centre of gravity is shifting to Asia and markets like China and India. Increasingly, automakers are developing global platforms that require supplier proximity, wherever they are in the world. India, which is pegged to be the global No. 3 car producer by 2021, is today is a key market for all global OEMs and suppliers. Valeo, automotive supplier and partner to leading OEMs, is upping the ante in India. Having had a manufacturing footprint in India since 20 years, Valeo India is actively engaged in leveraging its understanding of the local market to become a leading technology solution provider to both OEMs in India and also globally. What’s more, the predominantly passenger vehicle supplier is also targeting the commercial vehicle segment and setting up a global R&D base in India. The Amalgamations Valeo Clutch plant in Chennai follows Valeo's global 5 axes methodology and the Valeo Production System rigorously to ensure customer satisfaction in terms of cost, quality and delivery. Targeting sustainable growth in India, Valeo says it is helping Indian OEMs address key challenges the country faces like the steep rate of road accidents, growing traffic congestion and high levels of pollution through its technologies. The company has come a long way since its entry into India in 1997 in the joint venture that made clutch and friction facings for clutches under the vehicle powertrain division. At the time, Valeo products introduced in the domestic market were of European standards and typically priced at a premium, thus reducing their competitiveness in an extremely price-sensitive market like India. Quickly learning from this experience, the company recognised the need for local expertise in design and production if it was to make inroads here. Valeo in India today operates four business divisions — powertrains, thermal management, vision systems and comfort and driving assistance — and supplies its products from a comprehensive portfolio to virtually every made-in-India car ranging from entry-level through to the most premium ones. The company has seven manufacturing plants producing powertrain, thermal, lighting, electrical systems and other products in Chennai, Pune, Noida and Sanand and an R&D and design centre located in Chennai. While it went about expanding its manufacturing base in India, Valeo also began building engineering capabilities by tapping local engineering talent, available aplenty, both for its domestic and global projects. While growth on the engineering side was muted till 2014, subsequently enhanced R&D activity saw the number of engineers grew from 350 to 1,800 by 2018. 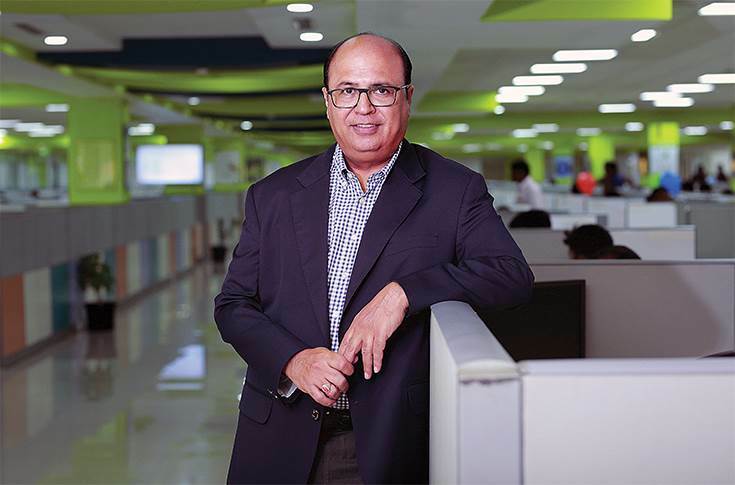 Impressed by the strong engineering capabilities at Valeo India and readily available talent, Valeo’s global management team is targeting an ambitious R&D headcount of 5,000 engineers by 2023. 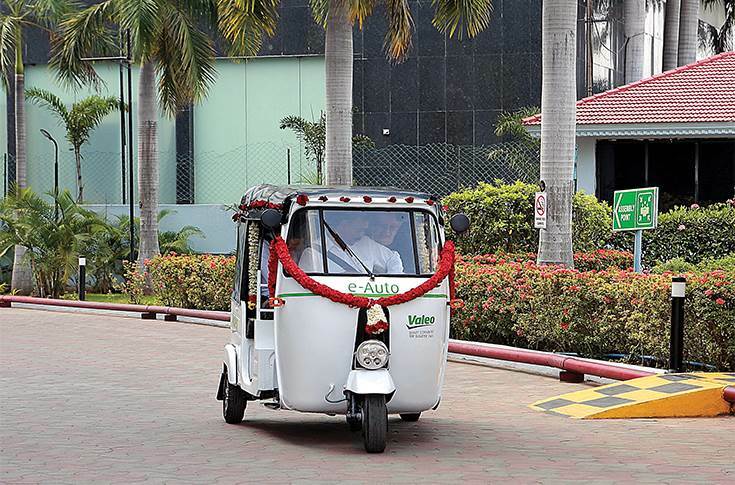 Working jointly with IIT Chennai, Valeo India engineers converted an IC-engined three-wheeler into an electric three-wheeler using a 48V 8kW e-machine as a prime mover along with regenerative capability. Valeo is working on localising more products to suit the needs of the Indian market. By July 2019, as per new safety norms, every new car will have to be equipped with a reverse parking sensor. Currently, Valeo supplies this component to some Indian carmakers through imports. But recognising the potential for high demand for this product, it is now looking to set up an assembly facility to make ultrasonic sensors in India by early 2020. Valeo is known for its products and expertise for passenger cars. Now the company is targeting growth in the commercial vehicle sector including three-wheelers. Following the acquisition of Spheros, the worldwide leader in air-conditioning for buses (and present in India through a JV), Valeo sees its share of the CV air-conditioning market growing. The auto industry is being disrupted by three simultaneous revolutions. With the rise of electric drivetrains and alternatives such as hybrid technology, there is a shift in the way cars are powered. At the same time, autonomous and connected vehicles and the digital revolution are giving rise to new forms of mobility. The Valeo Group’s innovation strategy, aimed at reducing CO2 emissions and developing intuitive operation, is aimed at developing a wide range of innovative products. Valeo says it is the leader in vehicle electrification solutions and that one in every three cars worldwide is equipped with a Valeo electrical system. The Tier 1 supplier offers both mild-hybrid systems (12 V to 48V) and high-voltage solutions (> 60 V) for plug-in hybrid and full electric vehicles. Valeo says its 48-Volt technology can be used on a small electric vehicle to make it a mild hybrid or even on a rickshaw. Valeo has a range of components – mechatronic actuators, sensors and electric supercharges — to help automakers manufacture clean, efficient, high-performance engines. The regulation requirements on passenger car electrification with focus on CO2 emission reduction will create opportunities for Valeo’s products — iBSG (48V), DC –DC convertor, eRAD (48V – P4), Gen 3 iStARS (12V – P0), 60kW motor + OBC + DC-DC converter, eSupercharger, eClutch, battery thermal cooling and LED lamps. Valeo believes the three-wheeler segment in India is going to play an important role in India's last-mile connectivity by adopting full electric powertrains. This, according to the company, is the next big growth opportunity in India. In March 2018, its Indian systems engineering team converted a conventional three-wheeler into an electric three-wheeler, using a 48V 8kW e-machine as a prime mover along with regenerative capability. This project, for which the battery was sourced from an external supplier, has been jointly developed with IIT-Chennai. After this first proof of concept, Valeo is confident about the success of this solution in India. Called e-Auto, it has been showcased to major customers across India and the company says the feedback has been positive. The vehicle travels 60-70km per charge, which takes three hours with a 48kW machine. “I strongly feel three-wheelers are the first and strongest contenders to adopt electrification compared to cars. We see this new segment growing rapidly in India and are getting ready to offer solutions,” says Belani. The Valeo brand with its fairly well-established network has a robust presence in the Indian aftermarket, due to its popular clutch, alternator, starter, lighting components and radiators. Also, other than its own products, the company also sources products like filters and shock absorbers from its suppliers. These are retailed through the Valeo brand in the aftermarket after thorough evaluation and quality checks. “We see huge growth potential in the Indian aftermarket. We have a 450-strong dealer network across India. Even if the market makes a shift to EVs, we still foresee strong growth for the next 15 years in the aftermarket business,” remarks a confident Belani. At present exports are minimal but it is bullish on leveraging the high level of competence of Indian manufacturing to global markets. For the Valeo Group, which is present in 33 countries through 184 production sites and 55 R&D centres, clocked revenue of 18.6 billion euros (Rs 149,004 crore) and spent 1.9 billion on R&D (Rs 15,221 crore) in CY2017, India is still a small market but bears handsome potential for future growth given the growing focus on introducing stringent safety and emission norms. Since 2015, Valeo India has been notching high double-digit growth and will look to achieve more. “To take advantage of this growing market, we are extremely well placed in India, both in manufacturing and R&D. We are committed to India’s long-term growth and ready to invest in the future, this makes our journey quite exciting. However, keeping our employees engaged and attracting new talent are some of the key challenges along the way,” says a candid Belani.